SATTRANS RT-2 Thuraya active indoor repeater (bi-directional amplifier) allows Thuraya subscribers to use their satellite phones and service in dead spots such as buildings, underground parking lots, shopping malls, tunnels, outdoor shadow zones, hotel rooms, where no satellite signal is available and use of docking stations is not possible or practical. Large industrial buildings, warehouses, hangars, etc. Provision of satellite service in unusual places, such as subway stations and tunnels, cruise ships, aircraft, trains, etc. Coverage in natural "radio shadow" places, such as behind hills, mountains, in the woods. Unlimited number of channels. SATTRANS RT-2 repeater does not limit the number of simultaneous calls possible in its service area, so the maximum capacity is on a par with the Thuraya beam capacity (64 channels). Automatic Gain Control. The Automatic Gain Control (AGC) feature allows operation of the repeater at different gain levels. AGC is critical for effectively serving Thuraya users located in various spots of the repeater coverage and at different distances from service antennas. Low power consumption. Low power consumption makes it possible to operate the repeater system continuously by using a solar panel of small dimensions. Compact design. The RT-2 repeater combines the light-weight and compact design with robust performance. The small dimensions of the product result in easy and quick installation and low (if any) site rental costs. 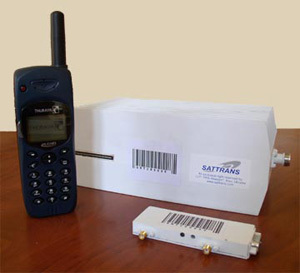 Wireless repeaters (bi-directional amplifiers) from Sattrans offer a high-quality and cost-effective solution for extending wireless (cellular or satellite) coverage in areas with low or inexistent penetration of the wireless signal. As the mobile usage rapidly grows in all parts of the world, very often places with inevitable needs for mobile use are left with weak coverage due to prohibitive costs of wireless networks expansion. Such places may include shopping malls, parking lots, sports arenas, industrial facilities, airports as well as outdoor space in hilly, wooded or urban areas. Repeaters can also be used to establish or improve coverage on trains, ships, ferries and even airplanes. The repeater system consists of three key components: 1) donor antenna, 2) bi-directional amplifier and 3) service antenna. The donor antenna takes the signal from a nearby cellular base station or a satellite. The signal is then amplified by the amplifier and re-broadcast by the service antenna. In the opposite direction, the signal from mobile phones within the repeater coverage is picked by the service antenna, amplified in the uplink stage and transmitted towards the base station or the satellite through the donor antenna.